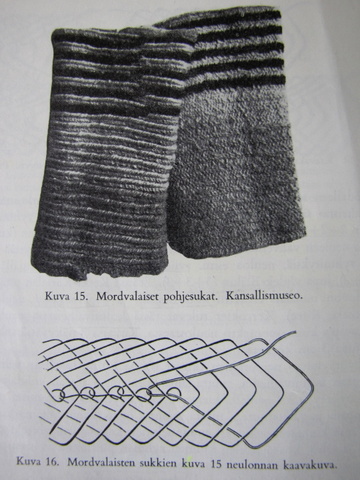 Kaukonen mentions this stitch in her nalbinding article (1960), and there's also a photo of a pair of striped leg warmers (from 1914), and a diagram of the stitch structure. Mordovia is a republic in Russia, in Volga Federal District. Unfortunately, Kaukonen does not show the connection stitch in the diagram in her article, and only vaguely describes that the connection is so deep that a string-like structure forms on the front side of the work. 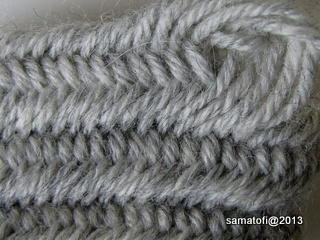 She also mentions that this stitch is a three-phased stitch, but on the drawing there are only two phases, I think. 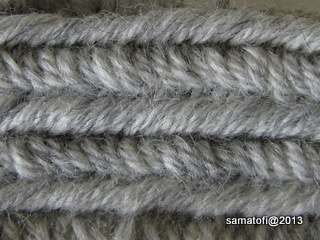 With my own experiments I have not managed to produce similar surface as on the photo in her article although I have tried several different connection stitches. This makes me wonder whether there is something funny in the diagram, or if I am missing something. On the photo below there's a string-like surface on the leg warmer on the left, but at the bottom edge of that leg warmer, the starting point or finishing point runs to opposite direction than usually, so one might think that either this photo is a mirror image, or the leg warmer was made left-handed, or the string-like surface visible was originally the reverse side of the fabric. A swatch made based on the diagram. Connection stitch F2. Front side does not resemble either of the leg warmers. Reverse side might a bit resemble the leg warmer on the left. I made swatches with connection stitches F2, B2, M1, M1+F1, R1+B1 (half-way on the reverse + edge loop B1), but any of those did not produce similar surface as on the photo on the top.